A one pack zinc rich cathodic protection primer, contains more than 50% Lamellar Zinc Particles in the dry film. ZincFix® ZincFlake is an organic bound zinc rich coating containing more than 50% Lamellar zinc particles in the dry film. It is applied to clean steel and hot dip galvanized surfaces to form an adherent anti-corrosive coating in excess of 50 microns thick. It is designed to provide excellent long term corrosion protection due to combination of active and passive corrosion protection properties. Apart from the cathodic protection provided by ZincFix® ZincFlake, the Zinc Flakes offer the additional advantage of excellent barrier protection. Cathodic protection is guaranteed by factors including contact between Zinc and Steel surfaces and the Zinc particles themselves. Due to the plate like structure, flakes have a larger surface area than spherical zinc dust. This allows for a lower concentration on Zinc in the film and has many benefits and coating characteristics that Spherical Zinc coatings do not offer. 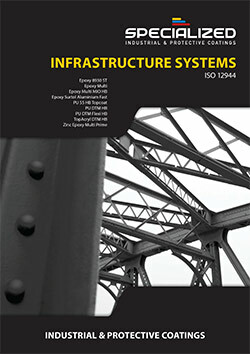 A lower film thickness can be applied can give equivalent corrosion protection to thicker applied conventional coatings. Over 2000 hours Salt Spray Test resistance. Elongated corrosion protection due to overlapping of the flakes, additional barrier effect, caused by the plate-like shape of the Zinc. The ZincFix® ZincFlake binder inhibits the depletion of Zinc, providing a long lasting combination of active & passive protection. The passive protection blocks the corrosive elements from reaching the steel. 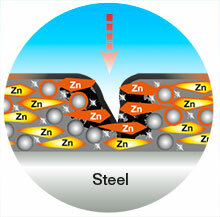 The ZincFix® ZincFlake sacrifices itself, protecting the steel beneath. 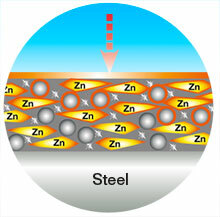 Upon impact the electron flow resulting from chemical reaction between zinc, oxygen, water prevents oxidation of metal.